All miniatures are to a 1/60 scale. (28-30mm) unless otherwise stated. January 4th 2019 - I have updated several parts of the site and removed items which I can no longer stock due to overseas restrictions or no longer being made. Clearance now includes historical and marvel miniatures, as well as the last of the remaining "Adventurers and Companions" range (which has now been removed). Dreamforge is no longer available. Project Z cannot be restocked and I am unsure if more will be produced. Oh and most importantly, some stock levels have now been updated. If an item is out of stock it may just mean I haven't updated the PayPal levels. More items will be added to the clearance section eventually. Please remember I am still running depsite the lack of updates, and Happy New Year! January 11th - I have uploaded 5 items to the Law Enforcement area. We will unfortunately not be attending Crusade due to health issues. September 28th - The site is now back online after a couple of weeks. November 12th - Dreamforge price reducitons (APC + Valikir Heavy) and additions (Command and Females). 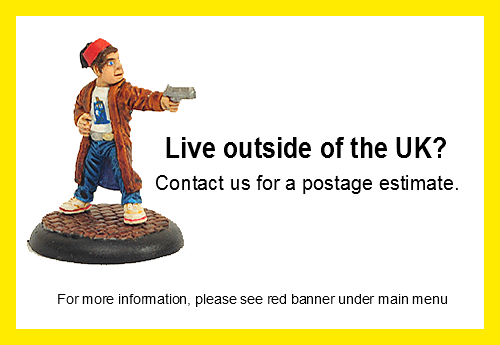 February 18th - Pre Order your Marvel miniatures and get a 20% discount on the RRP. February 10th - Jersey Barriers and 3 Tank Trap/Dragons teeth sections have all been uploaded!